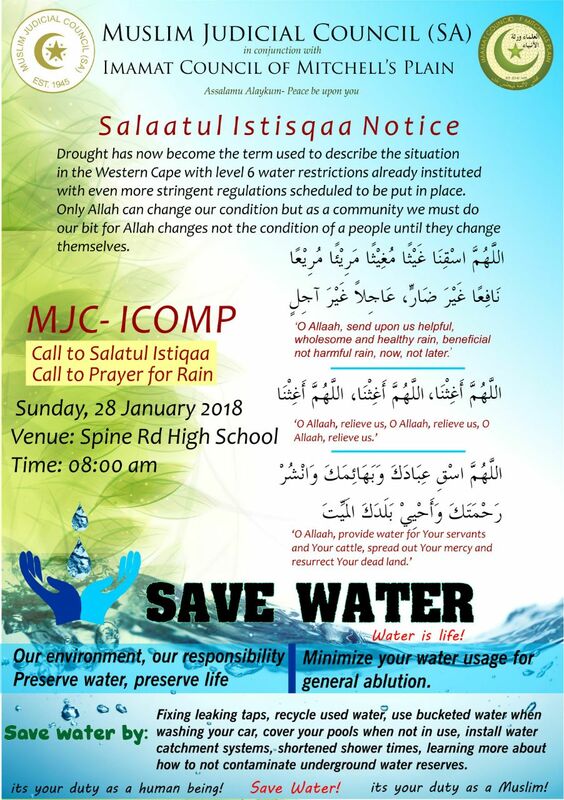 The Muslim Judicial Council (SA) calls upon the Muslim community to identify with the drought that we are currently experiencing in the Western Cape and to use it as an opportunity to draw closer to Almighty Allāh. The rains are withheld from us because Allāh wants us to turn to HIM in sincere Taubah (repentance) and Istighfaar (forgiveness) and to transform our lives in a meaningful way. 1. For every Imām of Masājid across the Western Cape to intensify in Duā’. 2. To motivate our community to increase in the making of sincere istighfār and in this process, to shed tears of remorse in front of Allāh Almighty. 3) The MJC calls for Salāh Al-Istisqā in our communities across the City. Each region should identify a central and suitable venue for the Salāh in consultation with MJC. As a start: the first Salāh tul Istisqaa will be on Sunday, 28 January 2018 at 08h00am in Mitchells Plain at Spine road high school. 4) We earnestly call upon each member of our community to use minimum water during Wudhu by washing each part once only. Washing once is also a Sunnah. This is applicable both at home and/or at the masjid. 5) Those Masājid which has not adapted its taps to preserve water should do so without delay. We thank you for your continuous support to the MJC (SA).